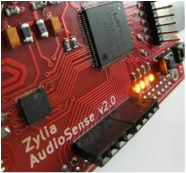 3D AudioSense - ZYLIA PORTABLE RECORDING STUDIO. MULTI-TRACK MUSIC RECORDING WITH ONE MIC. Sound recording is performed in real-time by microphones embedded in each sensor node. Audio processing and coding will be performed externally or inside the wireless sensor network. This process is optimized taking into consideration signal correlation and all the hardware limitations of the constrained sensor nodes. The system will be highly mobile and easily deployable as all the sensors will be battery operated and will be able to self-organize using their wireless interfaces. AudioSense can greatly improve the listening experience through high-density 3D audio coding and spatial sound scene reconstruction. Additionally, AudioSense can support flexible manipulation of sound scene at the receiver side, allowing for its rendering with a traditional set of surround sound loudspeakers, as well as an advanced higher order ambisonic or a wavefield synthesis system. Therefore, the user will be immersed in his favourite music performance, documentary, sport event and live TV broadcast. Project was funded by the National Centre for Research and Development (NCBiR), Poland, "Leader" programme.